Smart Casual is a great style both for the office and on the streets. This young man pairs a tan plaid sport coat with creased, slim fitting, grey slacks. The brown side buckle shoes are an accent, as well as a compliment to the sport coat. 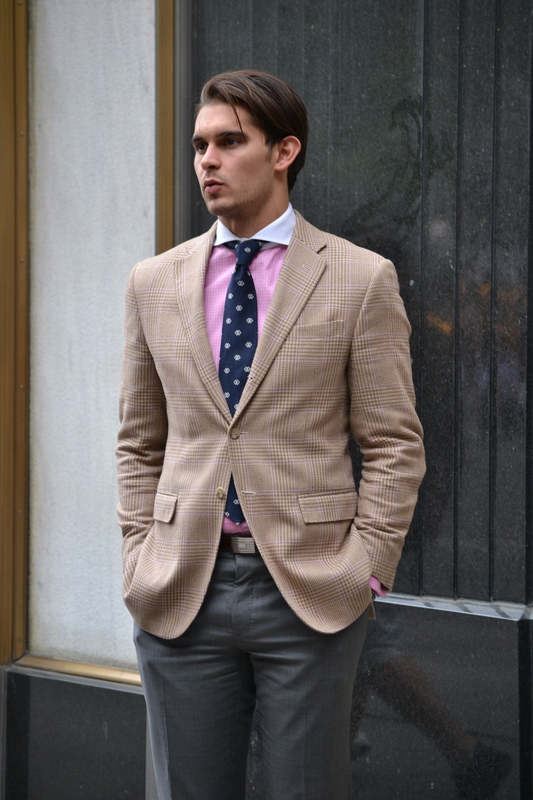 The pink, french cuff, cutaway collar shirt is a great accent. The pink color is bright and noticeable, but ties in well with the tan sport coat. The navy blue tie, with a windsor knot, narrows the neck and draws a powerful line down the center of the chest. Posted on April 20, 2012 by Capture the Streets	This entry was posted in Fashion From the Streets and tagged fashion, Men's Fashion, New York City, photography, Pink, Smart Casual, style. Bookmark the permalink. The undone buckles are throwing me off a bit. Other than that, great outfit!